Lovely, LARGE, private mountain condominium located within the town of Winter Park, yet secluded & quiet next to the Fraser River with wonderful views! Very short walk (1-10 minutes) to most town restaurants and shops. NEW RECREATION CENTER!! This 3 bedroom, 2 bath condominium comfortably sleeps 8 people with 1250 square feet providing room for family & friends. Bedroom details: King Bed with very comfortable Memory Foam and Cable TV in Master Bedroom, Queen Bed with Memory Foam in 2nd Bedroom, 4 Twins in bunk-style and Cable TV for kids in 3rd Bedroom. All mattresses recently new. New carpet, wood flooring, vanities & fixtures, granite counter tops throughout! Full Kitchen-all utensils, Keurig and Regular Coffee Machines, Wood Fireplace, Large Deck with Fraser River streaming across the meadow below and spectacular Mountain Views, 3 TV's (42" HD Flat Screen TV in Living Room with Blu-ray and streaming video for Netflix, Amazon and Hulu subscribers. Master Bedroom has a 32" HDTV & there's a 24" TV in the Bunkroom, each connected to more than 150 channels of satellite TV, with an I-Pod player & charger also featured in LR! Secured Wi-Fi is free during your stay. FREE SKI SHUTTLE and TOWN BUS picks you up right outside building - JUST 2 QUICK MILES to be dropped off RIGHT BY THE SKI LIFTS! Check schedule at www.wpgov.com and click on the Blue Line route. Our new Recreation/Health Club opened in 2016 (see recent photos) and is ready for every season with a fantastic indoor pool, 2 large indoor hot tubs and one outdoor hot tub!. It includes an indoor pool table, cable TV area, dining area, locker room, showers, and coin-op laundry facilities. Seasonal activities include skiing, hiking, biking, snowmobiling, sledding/tubing, fishing, hunting, boating, and golf. Many hiking and biking trails begin right outside condo area. (No smoking or pets are allowed in condo). * Rates listed below are 23% to 44% BELOW the best discounted rates advertised for similar condos in Winter Park. * Call or e-mail ASAP to reserve. We still have Holiday and Spring nights available! * In Order to reserve, your Deposit of 50% by either a Check or a Credit Card is Required. * Check availability at Rental Calendar below, but please call for latest update. * Full amount will be required if reserving within 30 days of your intended stay. * Minimum Stays: 3 nights for all weekends, 6 nights for Christmas/New Year's. Sorry-no single night stays. Cleaning Fee of $145 may apply for certain reservations, including stays of 3 nights or other lower cost periods. * Discounts shown on posted prices: 7-9 nights - 20-21%, 10 or more nights - additional 10%. * Many Ski dates ARE STILL AVAILABLE! Pictured here are some of the owners of this wonderful Winter Park Condo enjoying time together after dinner in August 2008. We all live and work in Denver, but each enjoys weekends in Winter Park to golf or bike in the summer, and to ski in the winter. Our adult kids still like the skiing and snowboarding, but also enjoy the time at our pool and hot tubs in the clubhouse, as well as the mountain base for the summer activities. We're confident that no matter what season you choose, you'll enjoy your time at our Winter Park getaway! Winter Park is a beautiful, quaint mountain community with many year-round residents, and as a result, its small-town feel is preserved, with most restaurants and shops not seeming too 'touristy' like many other mountain resorts. And yet, even as a small town, it carries so many options for things to do and see, that one would need to spend several weeks to do them all. 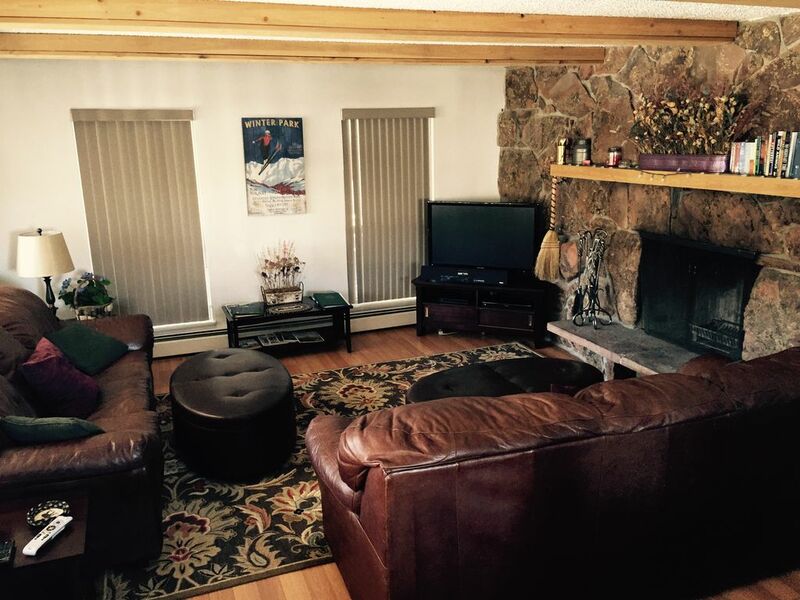 We enjoy spending weekends here as our nearby, yet 'away-from-it-all' mountain cabin. After we enjoy our skiing, cycling, golf, fishing or other activities, we truly love the relaxation by soaking in the pools or hot tubs at our clubhouse, and then enjoying a dinner nearby or preparing one ourselves inside our condo. In the summer, we love to sit outside on the deck listening to the river below while eating our meals or simply reading our books. Each time we head back home, we immediately begin to miss the time spent with friends in our mountain town, and then start planning our next visit. Our condo is walking distance to all shops, restaurants and movie theatre in downtown Winter Park. Also, it's just 1/2 mile to the newly-built recreation center. Our Condo is in the town of Winter Park, so all shops and restaurants are within walking distance! Continental Divide view to the east, and Ski area visible to the south from living room windows. The Fraser River is about 85 feet away, often with moose grazing nearby, viewable just below our main deck and living room picture windows. Summer evening temperatures sometimes dip into the 40's and 50's, providing all the necessary natural air conditioning even after the warmest days. Daily highs rarely exceed the 80's in Winter Park. Bedsheets available for queen sofa sleepers, as well. Located in Rec Center Clubhouse nearby. High Speed Internet Access Available via WiFi for Free! Replacement towels are available for stays over 3 nts from our MGMT Co. Call 970-726-5741 to arrange an exchange of used towels for clean ones. Clubhouse has no towels-Bring your own Pool Towels! Available in new Rec Center Clubhouse! Full entertainment options, with satellite TV, streaming video options, and I-Pod player for music. New Regular Coffee Maker in 2017. New Keurig Coffee Machine in 2018. More than 150 channels of DirecTV, with 85 channels of HD. Living Room has 42" television, Master Bedroom has 32" TV and Kids' bunkroom has 24" TV. Streaming Blu-Ray DVD player! Use your Netflix, Amazon, Hulu, Vudu or other streaming service account to watch movies! We have board games available inside our condo for all ages, from chess and checkers to Yahtzee & Monopoly. I-Pod Dock & Player integrated with television sound system in Living Room. Bring adapter for older I-Pod connection to newer I-phones. 56 music channels on DirecTV. Streaming via DVD player. Available in the new Rec Center Clubhouse! There are multiple places for bike rentals in Winter Park and in Fraser. Tennis courts at nearby school in Fraser. Pole Creek, Grand Elk, Headwaters and Grand Lake Golf courses are all minutes away. Great Pool in Rec Center Clubhouse nearby. Bring towels from the condo, or even better, bring beach towels of your own! Clubhouse has Swimming Pool, 3 Hot Tubs, Washers, Dryers, Locker Rooms, Showers, Condo is a very Short Walk to Town Restaurants & Shops, it's simply a Quiet Riverside Condo with great views! Moose often graze in the adjacent meadow, complimentary coffee, Shampoo, Soap & Lotion upon arrival! A collection of books, games & videos are also available, Linens and towels replaced as needed upon request during your stay. Free WiFi! Wintertime Activities also include: Half-Pipe and Rail Park for snowboarders, Sledding/Tubing, Cross-Country Skiing, Sleigh-Rides, Mountain Cat Rides for Non-Skiers, Dog Sled Rides, Skating, Ice-Fishing. Summertime Activities also include: Rocky Mountain National Park Tours, 600 miles of off-road bike trails, Longest Alpine Slide in Colorado, Climbing Wall, Bungee-Trampoline, Chair-Lift to Mountain-Top for Hikers and Mountain Bikers, both casual and Free-Style Mountain Biking, Roller-Blading.